Will Evil Prevail? described the next set of sessions, Thursday afternoon at TED. Dr. Irwin Redlener, public health specialist and author of Americans at Risk, is a pioneer in the field of disaster medicine--the medical care needed after natural and man-made catastrophes. Redlener's talk focused on our lack of readiness for the likely day when terrorists attack our cities with nuclear weapons. Is such an attack likely? Consider that: (i) The International Atomic Energy Agency has reported 18 instances of stolen plutonium or highly enriched uranium from the former Soviet Union. Only 13 pounds of plutonium or 25 pounds of highly enriched uranium is needed to build a bomb equivalent to the ones that destroyed Hiroshima. (ii) The schematics of nuclear bombs are readily available online. (iii) Organized but stateless terrorist organizations are retaliation-proof. And (iv) Russia cannot account for 84 of their 132 suitcase bombs. To prepare for what would be a much more devastating nuclear attack during the Cold War, the US employed delusional defenses--Bert the Turtle told school kids to Duck and Cover! And FEMA prepared an urban evacuation plan that unfortunately required 4 days notice of a missile launch. To avoid the fallout cloud, you have 10 to 20 minutes to walk at least a mile away from the blast, preferably heading cross wind and keeping your face covered. If you cannot reach that distance in time, seek shelter in either a basement or the upper stories (at least the 10th floor) of a building. Next we heard from Phil Zimbardo, the social psychologist who conducted the famous Stanford Prison Experiment in which college students displayed a 90% disposition to exact torture others when instructed by an authority. In his book The Lucifer Effect, Zimbardo describes the short list of factors needed to turn most any nice person into an Abu Ghraib Prison Guard. Zimbardo also discussed his current work on the factors needed to turn someone into a hero who defies risk in adverse situations to help others. His examples of everyday heroes included the Abu Ghraib whistle blower, and the grad student who forced Zimbardo to terminate the Stanford Prison Experiment--a heroine whom Zimbardo later married. Harvard political scientist Samantha Power, author of A Problem From Hell, raised our consciousness of Rwandan genocide, lamenting the apathy among our population and media. Just like it happened in 1941, the first American reports of widespread genocide in Rwanda were indeed covered by The New York Times, but not on the front page. Power's congressional representative reported that her office received hundreds of calls from constituents worried about the Rwandan apes, but none who mentioned the people. 1. Dave Eggers, author of several non-conventional books, the best of which is (in my humble opinion, but apparently not his) A Heartbreaking Work of Staggering Genius. TED recognized Eggers for his campaign to build several inner city tutoring centers staffed by writers. The first one, named 826 Valencia in Dave's hometown of San Francisco, was sited in a storefront that had to sell something due to the neighborhood's zoning laws. So Dave and his friends sold Pirate Supplies (peg legs, planks, etc. ), which, surprisingly, paid the rent. 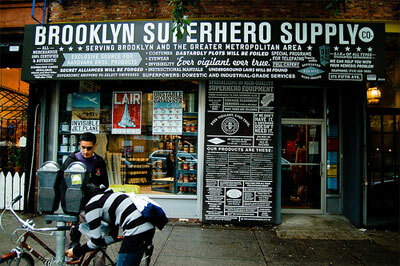 In the same spirit, their storefront operations in other cities sold things too, such as Brooklyn SuperHero Supply (capes, secret identities, manuals...) and The Time Travel Store ("Whenever You Are, You're Already Then"). Since each prize winner also gets a wish, Dave's wish was to recruit 1,000 people to personally help their local public school in some meaningful way. 2. Neil Turok, particle physicist and co-author of Endless Universe, has advocated a theory that ascribes the Big Bang to a collision of two universes. TED recognized him for his founding a math and sciences university in Africa, where Neil grew up. Neil's wish was that the next Eisntein would hail from Africa, and enlisted TED's help to increase his university's enrollment across all the nations of that continent. Bottom line: Redlener and Eggers were the highlights.